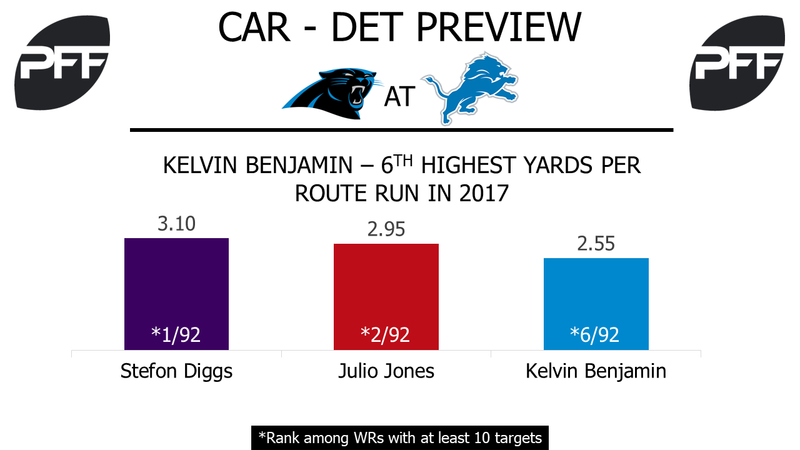 WR Kelvin Benjamin vs. CB Darius Slay – Benjamin enters Week 5 as one of the most efficient wide receivers this season with his limited targets. He has graded out to 80.6 in 2017, the 15th highest among wide receivers. Benjamin has yet to drop a pass on 13 catchable targets, the second straight year he is has started the season without dropping a pass in the first four games of the season after dropping three passes in his first four games his rookie year. The former Seminoles’ 2.55 yards per route run in 2017 is not only a career high but ranks sixth in the league among wide receivers. Slay has shadowed the opposing team’s top receiver in two of the four games this season so he could be following Benjamin around the field. Slay’s 46.0 passer rating allowed is the 11th-lowest by a cornerback this season while shadowing players like Odell Beckham Jr. and Julio Jones. HB Jonathan Stewart vs. LB Tahir Whitehead – Stewart has been a major part of the Panthers’ rushing attack this season, accounting for 69.3 percent of the team’s rushing yards by running backs in 2017. He has forced 11 missed tackles while rushing and has gained over two yards after contact per carry in every game this season. But Stewart might have trouble getting going with Whitehead, the third-highest graded run defending linebacker (87.7), meeting him on the field in Detroit. Whitehead’s eight run stops are tied for the fifth-most by a 4-3 outside linebacker, and to back that up he has only missed one tackle in 79 run-defense snaps. QB Cam Newton vs. Edge Anthony Zettel – The way Newton has dealt with pressure in 2017 is unlike any other season in his career. He enters Week 5 with the third-highest passer rating under pressure at 90.6. But Newton has been sacked on 26.1 percent of his dropbacks under pressure, the fifth-highest among quarterbacks. When blitzed though, Newton’s passer rating jumps up to 127.3. The Lions defense has recorded eight of their 10 sacks this season with only four pass rushers, led by Zettel’s four sacks. If Zettel can add to his 20 total pressures this season without blitzing, Newton may struggle. G T.J. Lang vs. DI Kawann Short – As premium as a matchup as you can get in the NFL. 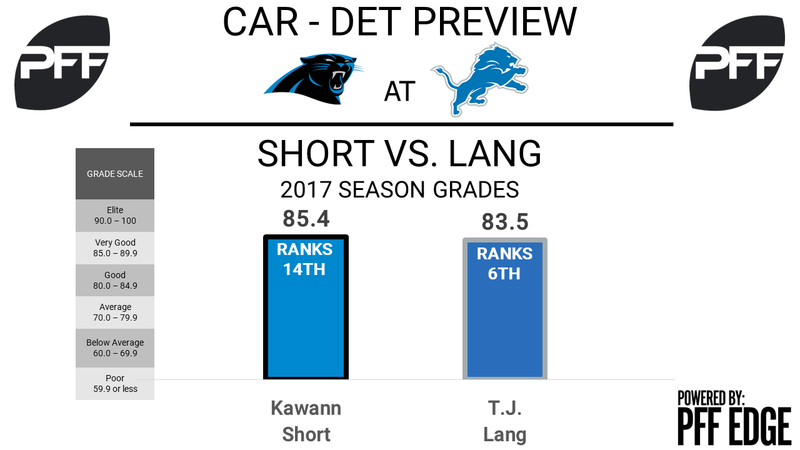 Over past several years both Lang and Short have graded near the top of their respective positions. This year is no different as Lang currently ranks sixth among guards with an overall grade of 83.5 while Short ranks 14th with a grade of 85.4. Lang has been one of the best pass blocking guards throughout his career but has struggled a bit this year producing a pass-blocking efficiency of just 94.7 which ranks 55th among guards. He’s surrendered 11 pressures on 155 pass-block snaps. Short on the other hand has maintained his status as one of the league’s best interior pass-rushers putting up the seventh highest pass-rush productivity at 9.2 while registering the fourth most pressures (14) among interior defenders. WR Golden Tate vs. CB Captain Munnerlyn – Since returning to Carolina this offseason to take over the starting slot corner job, Munnerlyn has really struggled. His 46.6 overall grade ranks 78th among cornerbacks, while he has allowed a passer rating against of 118.8 while lined up in the slot. Munnerlyn draws a tough matchup this week in Golden Tate, who is quietly having his best year as a pro and is currently the sixth-highest graded receiver with a grade of 83.7 overall. While Tate hasn’t produced a huge game yet this season, he has been a mismatch for opposing defenses in the middle of the field and has the second most receptions from the slot with 19. HB Theo Riddick vs. LB Luke Kuechly – Arguably the league’s best linebacker, Kuechly, matches up against the league’s premier receiving back in Riddick. Kuechly is currently the second-highest graded linebacker at 89.8 and he has returned to form dominating in coverage. Riddick has gotten off to a very slow start, earning an overall grade of just 56.6 overall. He has been targeted less than five time in a game twice already this season, a feat that only happened once all of last. Despite the slow start Riddick has been effective in the passing game, ranking 17th among running backs in receiving grade at 77.1 and 22nd among running backs in yards per route run at 1.38.